Explore books for the elementary crowd! Caution: Read Three Times Lucky before diving into The Ghosts of Tupelo Landing. All anyone can talk about lately in the small town of Tupelo Landing, North Carolina, is the auction of the old–supposedly haunted–inn. Mo LoBeau, co-founder of the Desperado Detective Agency, doesn’t go looking to take on a haunted inn as one of her cases, but things have a way of falling into her lap, especially when Miss Lana and Grandmother Miss Lacy Thornton sort of accidentally purchase the inn in question. Pretty soon, Mo and Dale are doing their best to solve the big mystery of the Tupelo Inn…while getting a bona fide supernatural source for their big history report. Sure, it gets scary at times, but these Mo and Dale–along with a new and unexpected ally–are on the case, and they’re determined to find out what this ghost’s story is. As often happens, especially when it comes to matters involving Mo LoBeau, things get complicated quickly. Someone–or something–is trying to keep Mo and company out of the inn. What could anyone else possibly want with an old, broken down inn? Besides a ghost, what other secrets could this old place be hiding? Mo and Dale are getting closer and closer to discovering the truth about the Tupelo Inn and its ghostly inhabitant, but what else will they discover along the way? Some people may not encounter an actual ghost, but they may be haunted by their pasts just the same. Can Mo and Dale solve more than one mystery surrounding this inn…before it’s too late? 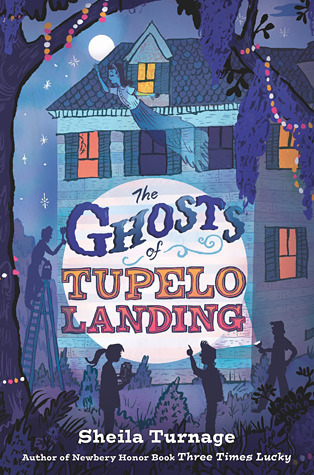 Help Mo and Dale unravel the mystery of the Tupelo Inn when you read The Ghosts of Tupelo Landing by Sheila Turnage! Stella by Starlight by Sharon Draper is a nominee for the 2016-17 South Carolina Children’s Book Award. Stella by Starlight takes place in the segregated South during the Great Depression, and it doesn’t shy away from the racism, hatred, and fear that was so prevalent at the time. (Anyone who is paying attention would agree that these things are still prevalent.) But this book also emphasizes the power of family, community, faith, and courage in the face of adversity. The book begins with Stella and her brother, JoJo, witnessing something disturbing in the woods next to their home late one night. They see men and horses in white robes. They see a burning cross. This sight can only mean one thing–the Ku Klux Klan. Stella and JoJo race home to tell their parents what they’ve seen, and the people in the community immediately come together to discuss what it might mean. With the threat of the Klan looming over everything, the people in Stella’s community wonder what they can do to combat such a seemingly powerful force. They’ve always dealt with racism, but this feels much more sinister. When several men, including Stella’s father, decide to stand up for themselves in the voting booth, the threat becomes even greater. Through all of this turmoil, Stella examines her own feelings through writing. Stella admits she’s not the best writer, but she practices late at night in the hopes of getting better. She has so many thoughts about what’s going on around her, and she wants to get them down on paper. She writes about her family, school, and community. She writes about the prejudice she experiences and sees around her. She writes about the people, both black and white, who come together and take a stand when times are hard. She writes about her hopes for the future. 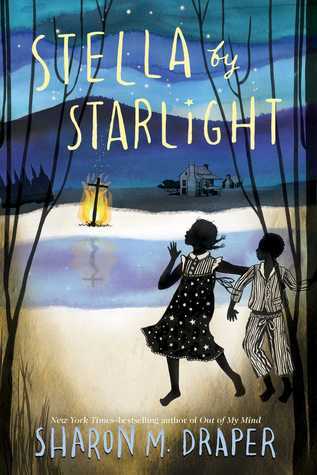 Stella by Starlight is an excellent piece of historical fiction, and I hope that many teachers and students will use it to supplement their understanding of racism, both in the segregated South and in the present day. I also see this book being used to help students with their writing…or whatever else they may be having trouble with. Stella freely admits that she is not a great writer and needs practice. Students need to see that it’s okay to make mistakes. What’s important is to keep trying and working to get better. Librarians, teachers, and parents who want to explore themes like bravery, integrity, empathy, tolerance, and respect with their students should definitely take a look at Stella by Starlight. It’s an extremely powerful book that will stay with all readers long after they’ve finished it. Anybody Shining by Frances O’Roark Dowell is a nominee for the 16-17 South Carolina Children’s Book Award. Arie Mae Sparks wants just one friend to call her own. She’s hopeful that her cousin Caroline, who lives all the way in Raleigh, will respond to her letters one of these days–and be the friend she’s always wanted–but it’s not looking good at the moment. Still…Arie Mae keeps on writing, telling her cousin about everything happening in Bone Gap, North Carolina. Though Arie Mae despairs of ever finding one true friend, newcomers in her little town may provide some hope. These new folks–who’ve arrived all the way from Baltimore, Maryland–have come to the mountains to learn about the nearby settlement school. Almost immediately, Arie Mae sees the potential for friendship in Tom, a boy who has a special shine about him. Even though Tom has a bad leg and can’t do everything the other kids can, he and Arie Mae form a fast friendship. He doesn’t care at all that Arie Mae is not as fancy as his sisters or that her family doesn’t have as much as his. He simply wants to hear her stories and go on adventures with her. Arie Mae is all for seeking adventure, but she soon learns that Tom has more difficulties than just a bad leg. His mother warns Arie Mae that her new friend has a weak heart and shouldn’t exert himself too much. Arie Mae worries about this, but Tom is determined to do just what he wants. What’s a friend to do? Through her continuing letters to her cousin, Arie Mae reflects on her friendship with Tom, her feelings about his condition, her family and their life on the mountain, and all sorts of other things. She thinks about what makes her world so odd to some and so special to others. Can people be true friends when they see the world so differently? 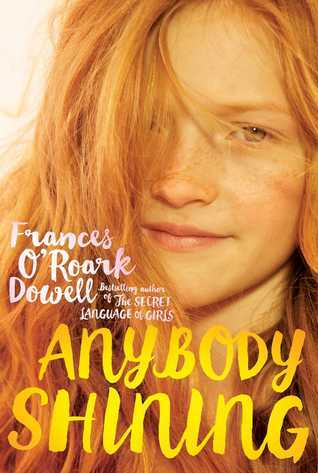 Learn more about the power of friendship, reaching out, and overcoming differences when you read Anybody Shining by Frances O’Roark Dowell. If you’d like to share this book with your students, here’s a short book trailer I created for Anybody Shining. Georgina Hayes needs to find a way to make some quick money. Her dad left Georgina, her mom, and her little brother with almost nothing, and they’ve been living in their car for way too long. They need a home, but Georgina’s mom is working two jobs and still struggling to make the money needed to make a deposit on a house or apartment. Georgina knows there’s got to be a way to help her mom, but what is this young girl supposed to do? Well, after seeing a reward poster for a missing dog, Georgina gets the bright idea to steal a dog. But it can’t be just any dog. It has to be a quiet, friendly dog. A dog that is loved by its owner. A dog that someone would pay a lot of money to get back. Georgina writes down her dog-theft plan in her notebook, and, with the help of her little brother Toby, she puts her plan into action. She finds the perfect dog, nabs him, and waits for the reward posters to go up. But nothing really happens the way Georgina wants it to. She feels guilty about what she’s done, and the dog’s owner may not have enough money for a big reward. This sticky situation is quickly spiraling out of control, and Georgina doesn’t know which way to turn. Can Georgina turn things around and get the money she and her family need? Will she do the right thing, or will she see her dognapping through to the bitter end? What will happen to make Georgina face all the wrongs in her life and do what she must to make things right? 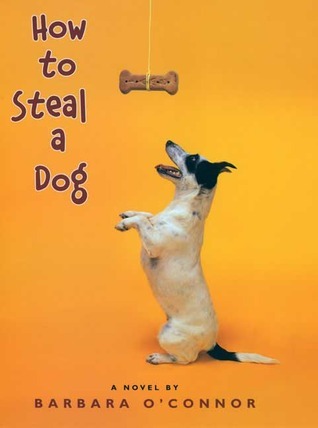 Read How to Steal a Dog by Barbara O’Connor to find out! Eleven years ago, Moses “Mo” LoBeau washed ashore in Tupelo’s Landing, North Carolina. This child, who was washed away from her Upstream Mother in a hurricane, was rescued by the memory-impaired, cantankerous Colonel and Miss Lana, and the three of them made a life for themselves in this small coastal town. This summer, however, things are being stirred up in Tupelo’s Landing, and Mo takes it upon herself to figure out what’s going on. One of the restaurant’s customers has been killed, a cop is asking questions about Mo’s beloved Colonel, and strange things are afoot in the town Mo calls home. What else is a precocious girl to do? Mo and Dale open up their own detective agency–Desperado Detectives–and begin investigating the crime. What these junior detectives find, though, may just change everything they know about the people they’re closest to. What secrets are hiding in Tupelo’s Landing? And how can Mo and Dale discover the truth when the police can’t? As Mo and Dale come closer and closer to solving the biggest mystery to hit Tupelo’s Landing since Mo herself washed ashore, they’ll learn just what family and friendship really mean. When waters get rough, it becomes clear who’ll be there for them, and even Mo might be surprised by who has her back. 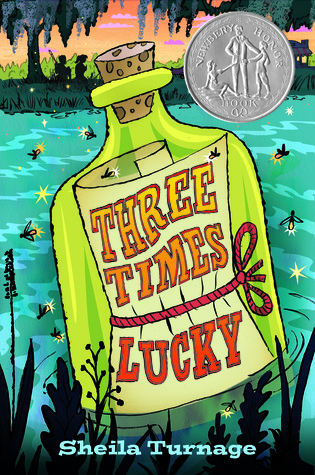 Join Mo LoBeau on her journey to the truth when you read Three Times Lucky by Sheila Turnage, a nominee for the 2013-14 South Carolina Children’s Book Award! Abby’s best friend is her beloved Shetland sheepdog, Tam. The two are always together, and they even compete in agility competitions (which they usually win because they seem to read each others’ minds). On the way home from a competition in Virginia, however, a horrible accident on the treacherous Blue Ridge Parkway separates Abby and Tam. Abby is sure that her precious dog is still alive and trying to find his way back to her…all the way home to Harmony Gap, North Carolina. Even when Abby and her family move to Nashville (something Abby is not happy about), she never loses hope that she will be reunited with Tam one day. Tam is lost and alone for the first time in his life. He has only two goals: survive and find his way back to his girl. As Tam makes his way south toward where he’s sure he’ll find Abby, surviving is becoming more difficult. Winter is on its way, and Tam must rely on all his instincts–and the help of some surprising new friends–to live through the season. As the days, weeks, and months pass, Tam begins to forget much about his old life as he becomes more like a wild animal and less like the pampered dog he once was. But, somehow, he always remembers that he belongs somewhere else, and he is doing everything he can to get back to the place–and the girl–that is his true home. Both Abby and Tam are facing new situations and dangers they never expected, but these two friends have a bond that transcends everything. It’s this bond that helps both of them hope for the day when they’ll see each other again. Even though hundreds of miles separate them, Abby and Tam are determined to find each other…and they’ll stop at nothing to make that happen. 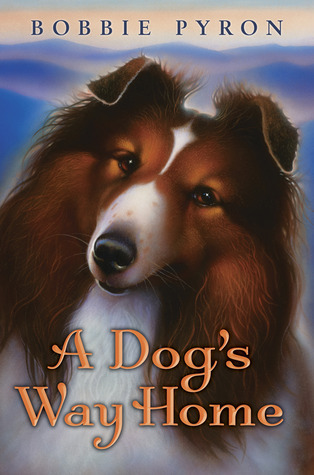 Find out how Tam makes his way home to Abby’s welcoming arms when you read A Dog’s Way Home by Bobbie Pyron. I’m confident that my students will devour this book. Books about dogs are not exactly a hard sell in my library anyway, but I think this one stands out from the crowd. A Dog’s Way Home is told from both Abby’s and Tam’s perspectives, so it shows how strong the relationship between pet and owner can truly be. Anyone who’s ever had a pet will appreciate this. There are so many things to love about A Dog’s Way Home–the setting, the relationships, the will to survive, and the love between Abby and Tam. I sincerely believe that my students will enjoy this book as much as I did. I highly recommend this book to all readers, especially those in 3rd-6th grades who have a special bond with their own pets. For more information about this heart-warming book and author Bobbie Pyron, visit http://www.bobbiepyron.com/.